To examine predictors of weight gain following breast cancer diagnosis and subsequent return to pre-cancer weight. 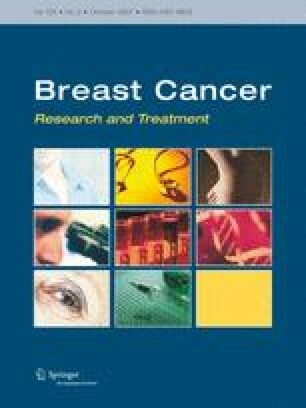 To determine (1) the associations of anti-neoplastic chemotherapy and/or, Tamoxifen® therapy on weight change following breast cancer diagnosis, (2) whether chemotherapy modified the effect of specific demographic and tumor characteristics on weight gain, (3) the proportion and characteristics of women who gained significant weight on chemotherapy and returned to their pre-cancer weight during follow-up. Participants were 3088 breast cancer survivors, aged 27–74 years. Weight was measured at baseline and years 1 through 6; pre-cancer weight was self-reported. Cancer stage and treatment modalities were obtained by medical record review; demographic and physical activity data were obtained from questionnaires. Weight gain of ≥5% body weight following cancer diagnosis was considered significant. Chemotherapy was significantly associated with weight gain (OR = 1.65, 95% CI = 1.12, 2.43) and Tamoxifen® was not (OR = 1.03, 95% CI = 0.71, 1.51). Tamoxifen® did not modify the effect of either chemotherapy or its different regimens on weight gain. Both types (anthracycline: OR = 1.63, p-value = 0.01, non-anthracycline: OR = 1.79, p = 0.003) and all regimens of chemotherapy (AC: OR = 1.55, p-value = 0.01, CAF: OR = 1.83, p = 0.003, CMF: OR = 1.76, p = 0.004) were associated with weight gain but the associations were not different from one another. Only 10% of participants returned to their pre-cancer diagnosis weight at the follow-up visits; the degree of initial gain (p for trend <0.0001) predicted that return. Chemotherapy was associated with clinically meaningful weight gain, and a return to initial weight following weight gain was unlikely. Body weight Chemotherapy Tamoxifen Anthracycline Cyclophosphamide Adriamycin Methotrexate Fluorouracil Cohort studies Women. This study was initiated with the support of the Walton Family Foundation and continued with funding from NCI grants CA 69375 and CA 72092. Some of the data were collected from General Clinical Research Centers, NIH grants M01-RR00070, M01-RR00079, and M01-RR00827. The authors thank Sheila Kealey and Christine Hayes for their editorial support.